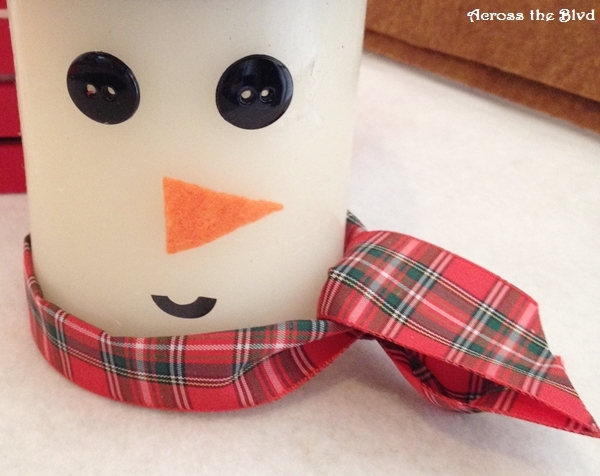 This little snowman is truly a quick and easy project to make. 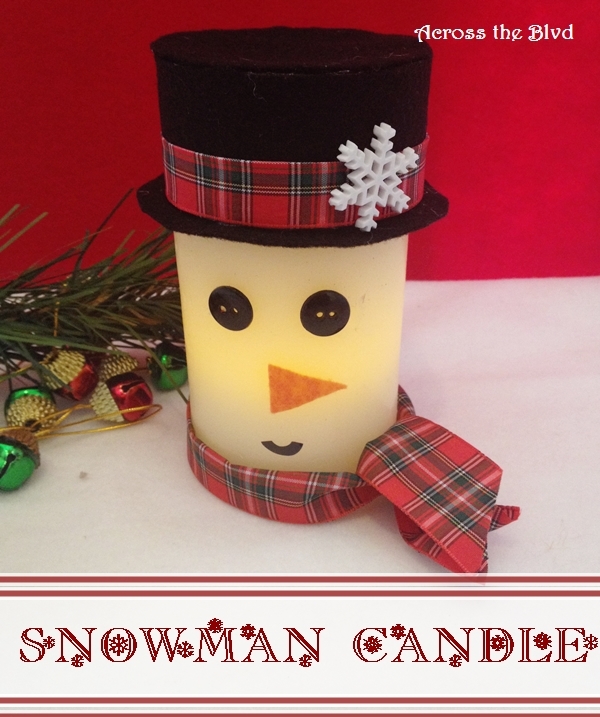 You’ll only need a few items to change a plain LED candle into a cute little Christmas Snowman. His hat is easy to make, too. I love the soft glow that he gives off when turned on. I began by gluing two buttons for his eyes. Next, I cut a small triangle from a piece of orange felt and glued it in place for his nose. I had a set of vinyl letters with adhesive backs. I used the letter C and cut it down to make his mouth. Lots of things could be used for this. Small buttons, a paint pen or yarn would all work. 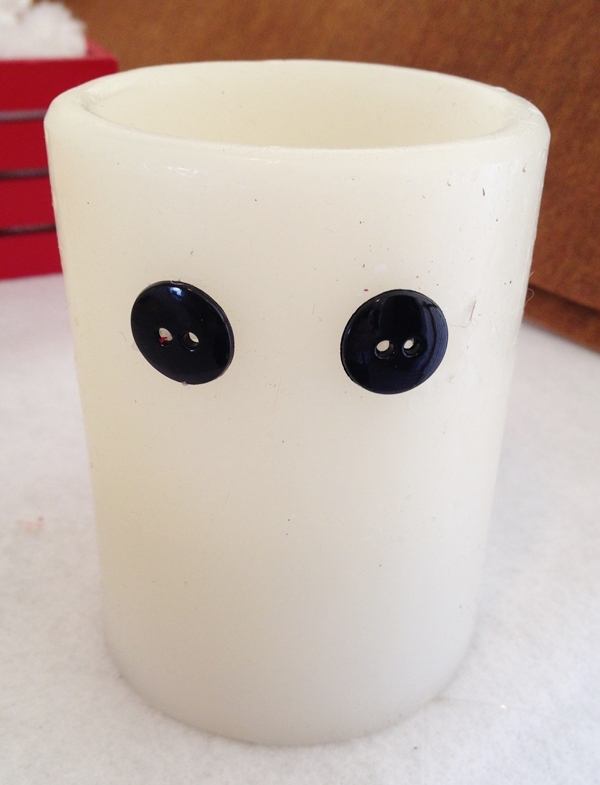 I wrapped a piece of ribbon around the bottom of the candle for a scarf and held it in place with a dot of hot glue. 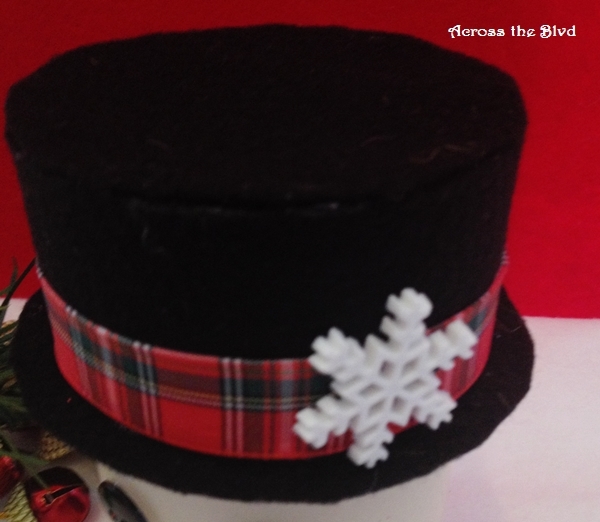 To make the hat, I used an empty ribbon spool. I’ve used tissue rolls to make other hats like the one I made for this Twine Snowman, but I needed something larger for this one. I pulled the spool apart and used the cardboard circle for the top of the hat. 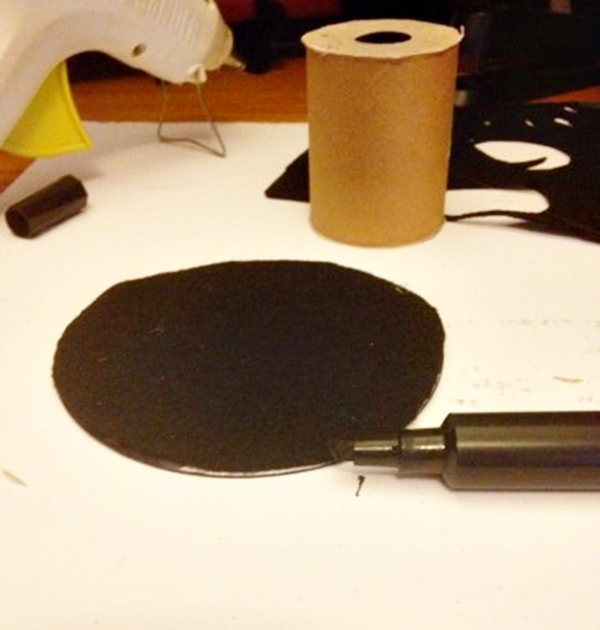 I traced a circle of black felt to fit the cardboard and glued it on. To make sure none of the cardboard was showing, I used a marker to color around the rim. 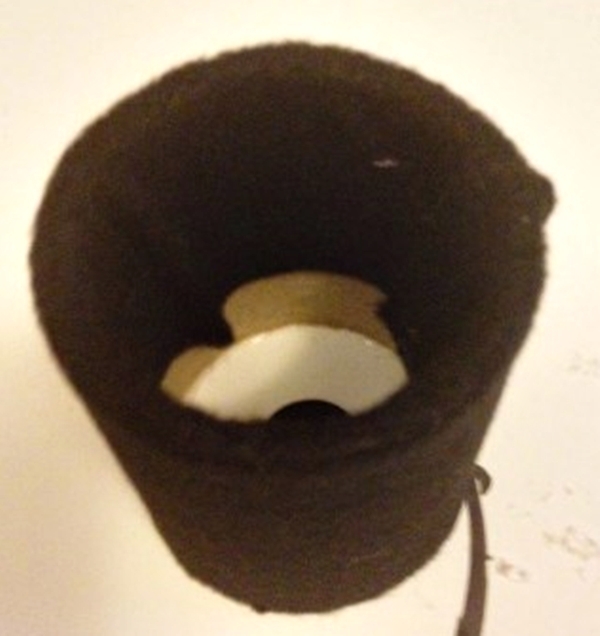 I wrapped felt around the cardboard spool and hot glued it in place, tucking it into the spool. I glued the round disc to the tube to assemble the hat. Once done, I wrapped a piece of ribbon around it and added a snowflake. It’s placed on top of the candle. I didn’t glue it down. Who doesn’t have an extra candle around? 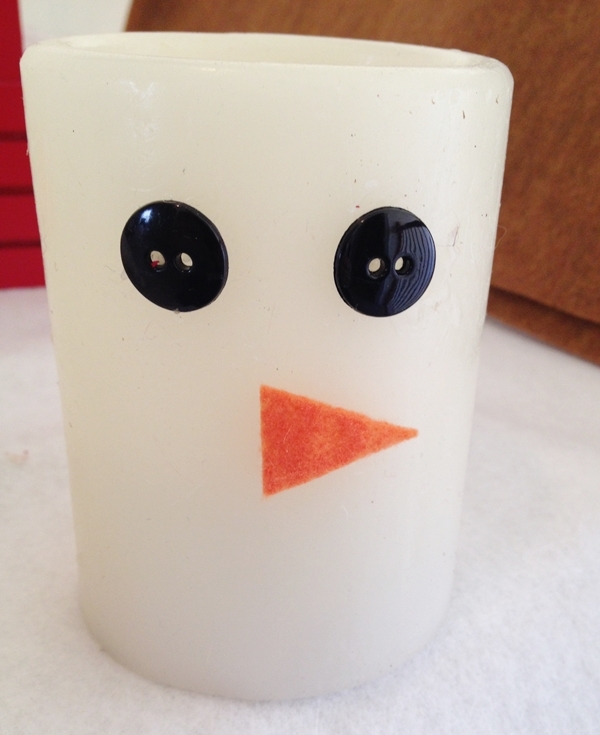 Why not use one to make a cute little Snowman Candle? I hope you’re all enjoying the holiday season! This is so cute and the hat is too sweet! Thanks for sharing a great idea! Thank you, Carolyn! It’s a fun little craft to make. What a great idea! Your snowman is adorable! I love how you made the hat with the leftover ribbon spool. And the use of the vinyl stick on letter is genius! Hope you are having a lovely week! Thanks, Laurie. He’s so easy to make, too just using some leftovers. Hope you’re have a great week! Ha! Yeah, a flame would be bad news! Thank, Millie! It is a really easy craft to make. Thanks! It was a fun and simple craft to make. Very kid friendly, too. Popping back over from Brag About It to thank you for linking up and sharing your cute snowman and lovely home with us! Thanks! It was a fun craft to put together. Thanks for hosting a great party each week, Laurie! Thanks, Winnie! 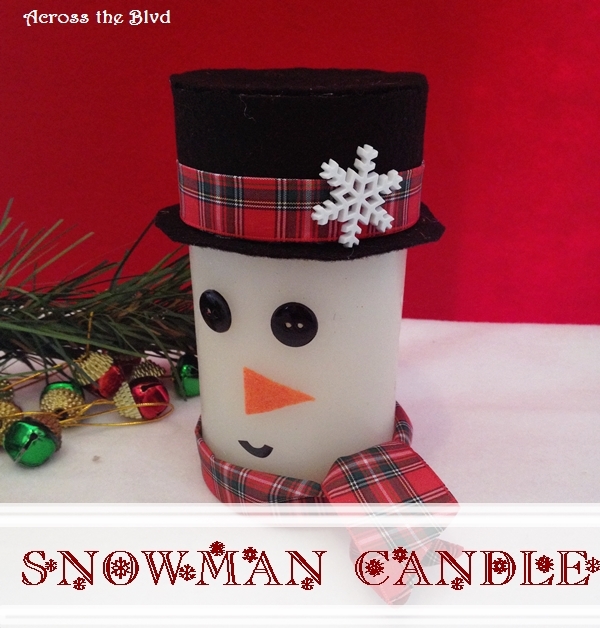 He’s a fun little winter snowman, not just for Christmas! Thank you, Debbie. No worries. It’s a very busy time of year for everyone! I hope you’re enjoying the holiday season. I’m sure your guests are loving your home decor. Merry Christmas! 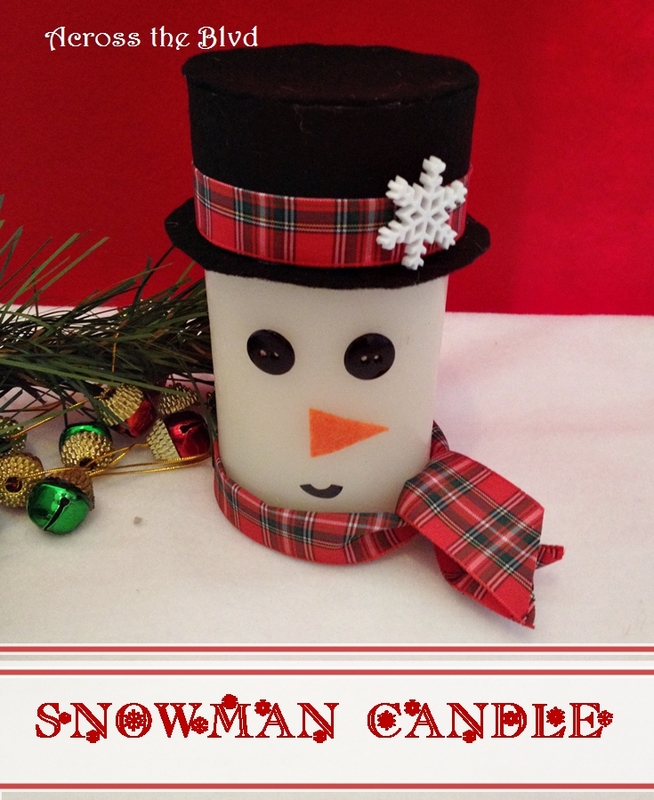 I’m so happy to inform you that I’m featuring your cute snowman candle at our Monday Cooking and Crafting with J & J Link Up!! We hope to see you again and enjoy the weekend. Thank you so much, Julie! I appreciate the feature! I’m happy you liked my Snowman Candle. Thanks for the party each week! This is so cute, my kids would love it! Thanks for sharing at What’d You Do This Weekend?! Thanks, Joy. I love that he’s a fun craft that can be made with children. Thanks for hosting a great party each week!